And now I'm going to post my build! 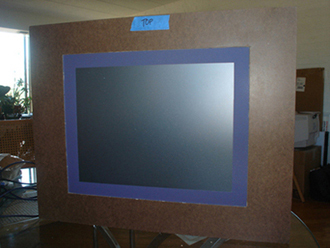 First, Thanks to Drew for your GREAT inspiration, and ENORMOUS support to DIY Cintiq by brought to us, DIYers, this forum. 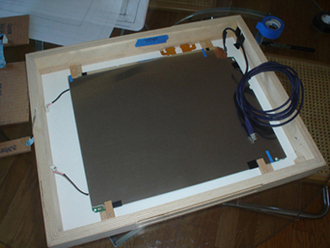 Last year (2007), I built my electronic canvas, with stripped Samsung 15" monitor placed inside ready-made Ampersand Hardbord canvas. 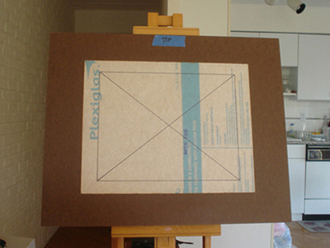 Then put them on the easel (as in the photo above). 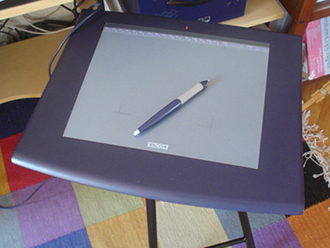 I also bought Wacom Graphire4 Tablet, and my first paint program, Corel's PainterX, to use with the easel. I found that this is not really an easy way to paint, compare to the traditional way of canvas painting on the easel. Because I have to look down to the tablet, then look up to the monitor just to position the screen cursor to paint. 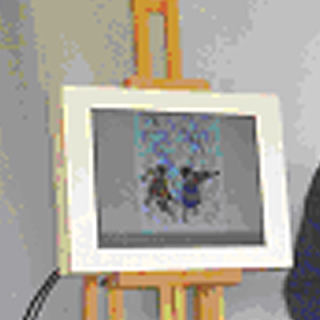 Upon registered the PainterX software, I received a free instructional DVD, 'natural media painting' by Jeremy Sutton. 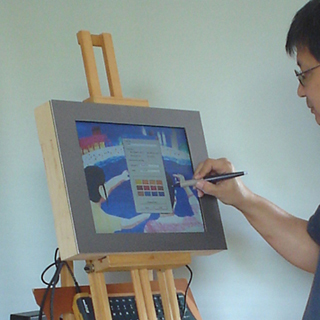 I watched Jeremy used Wacom Cintiq to demonstrate his way of painting with PainterX program. 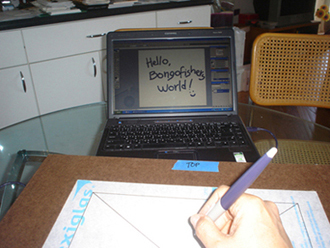 I realized that this is it, this is the right way to draw or paint, just draw or paint directly onto the screen. But I could not afford one, at the moment. 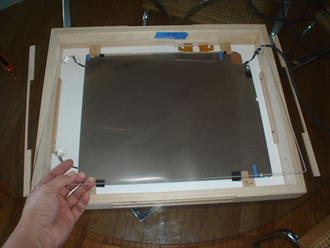 Then I came across Drew's DIY Cintiq. I planned to build my own Cintiq. It took a while to gather the items necessary for the build, most of which I got from ebay, Wacom Intuos2 9x12 Tablet, Dell 1503fp Monitor, etc. 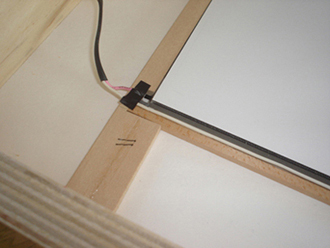 I spent a lot of times researching and studying those who built their DIY Cintiq, just to make sure that I know enough to build one without any mistake. What I want to acheive is to build a next version of electronic canvas, that I can draw or paint directly onto the screen which I am calling it CanvasTIQ! 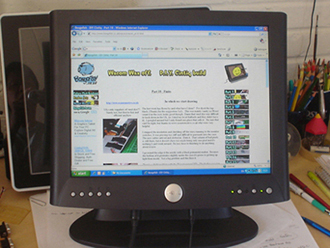 When I first got my 1503fp Monitor, I didn't know what REV it was! I stripped the monitor to see what kind of FFC cable to be used. It's REV 00, Samsung LCD. So I need two FFCs 40-pin, 0.5 mm pitch, from diy-beamer. After I tested the LCD screen on top of the Tablet, I noticed the jitter on the top left corner of the LCD. But I was not worried about the jitter for now. The problem could be solved with shielding later. 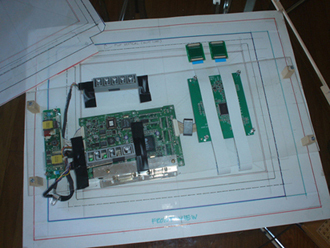 I measured all the PCB, inverter, mainboard, and screen driver board, the length of all the wires. 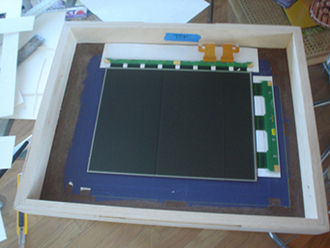 main board = 6-1/2" x 6-1/2", inverter board = 1-3/16" x 4-3/4", screen driver board = 3-3/4" x 4-1/2". 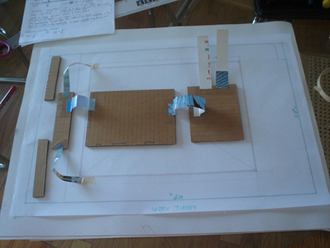 And then I cut the cardboard to sizes and use these cardboards to layout the parts instead of using the real boards. 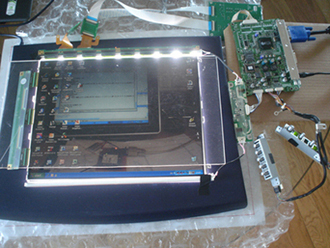 Before I put away the stripped LCD, I tested it with the tablet. I noticed the jittered appeared on top of the LCD screen. Attached is the mpeg video of the jitter. I measured all the dimension of the tablet. 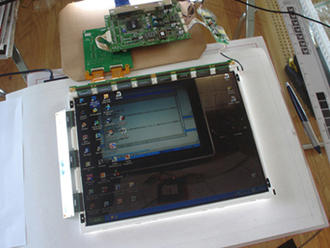 So I can map the active area of the tablet with the LCD screen. 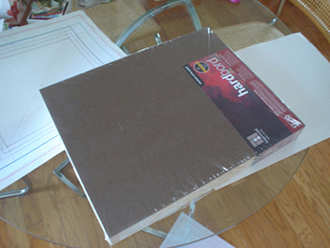 Here is the 16" x 20" ready-made Ampersand hardbord canvas. 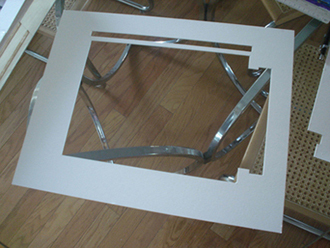 This canvas has 3/4" thick x 2" deep frame. Enough depth to put everything inside. 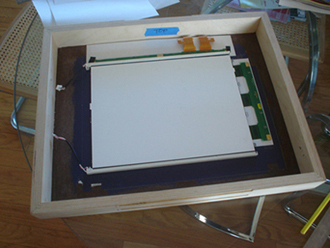 The drawing of the components was placed in the canvas. 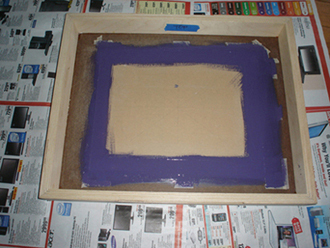 The canvas are marked with the blue painter tape, ready to cut the openning for the non-glare plexiglas (11" x 14") . 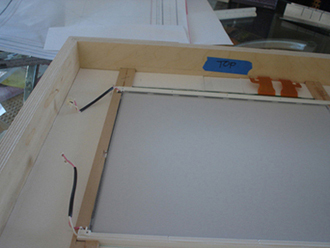 The 3mm(1/8") thick, 11" x 14" non-glare plexiglas was installed to fit into the openning area. 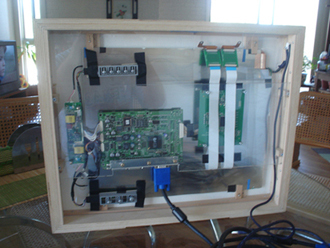 I filled up the gap between the the hardbord canvas and the plexiglas from the inside. 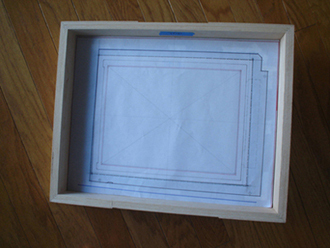 And painted one inch border around the 9" x 12" active area over the plexiglas. Here is how it look from the front. 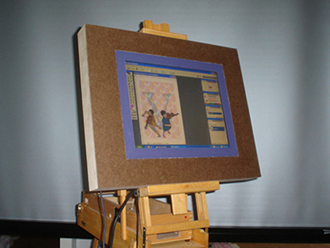 After the paint dried (I put four coated on), I tried to aligned the LCD to the openning of the canvas. 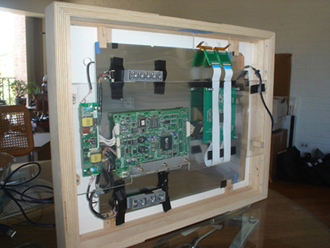 All the LCD parts were temporary put in place. 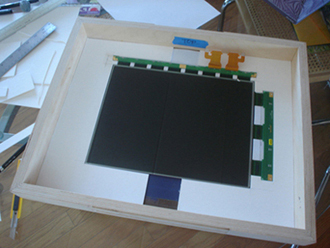 I used the left-over matboard, which have the same thickness as the LCD glass to construct a temporary frame around the LCD glass panel. And this is the final frame trace from the temporary one. 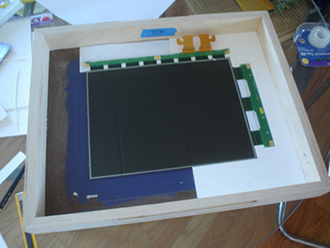 The backlight acrylic block and the three plastic layers of the LCD is about 5/16" thick. 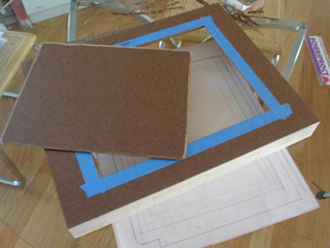 So, I use 1/2" wide x 5/16" thick basswood (the same kind of wood that used by the architectural model builder) to build the frame to hold the acrylic block. 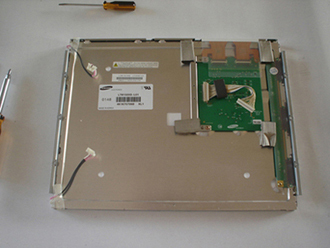 I removed the backlight covers, which were extended higher than the LCD frames. 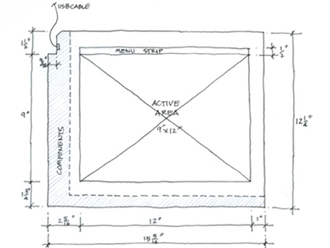 Put the tablet over the LCD, according to the layout drawing. I added another layer of 1/8" thick acrylic sheet on top of the tablet. Built a platform for all the PCB with a smaller piece of acrylic (1/8" thick). 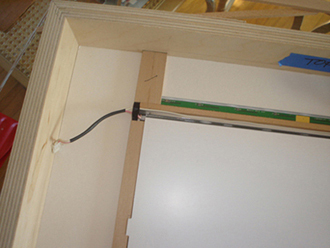 Then secured the platform with a piece of 1/2" x 5/16" bass wood frame. Here's how it look from the back. Up to this point (everything were in place), I only did a test on the tablet. And still notice the jitter on the top part of the screen. Probably, because I haven't do the shielding yet. I will test and post the result soon. Wow. That's an amazing first post. I'm gobsmacked. I love the whole concept of this build. 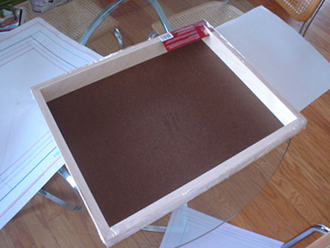 The case built into a canvas and mounted on a easel just feels right. I also love the care and attention to detail you've put into it. The view from the back is a neat and tidy as any I've seen. It looks as good as the front view! 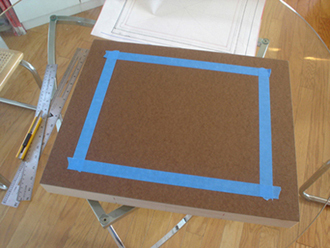 Using the mat to hold the panel in position - great idea. One source of jitter or drop-outs may be the metal shielding around the lights. However it's best to try other stuff first. 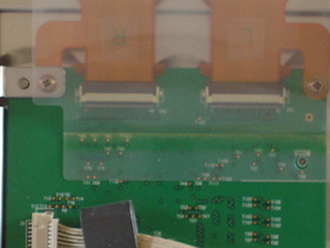 While the shielding isn't particularly difficult to remove, (remove the tape down the back, remove the wire through the slots in the rubber bungs), the tubes are incredibly fragile. Also the metal helps to dissipate the heat from the lights. I removed mine and heat hasn't proved terminal yet. 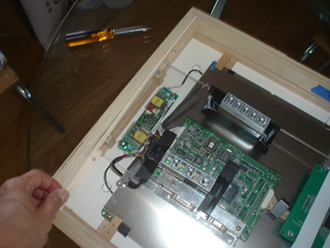 I went back and shield the top PCB of the monitor, and also shield the components part of the Tablet. Here is the video of the CanvasTIQ after the shield. 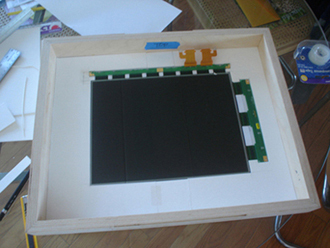 It have some improvement, the jitter on the top part of the screen seem to be less than before shielding. And if I put the tip of the pen very close to the screen the jitter seem to disappear! Precisely realized and perfectly documented and explained. 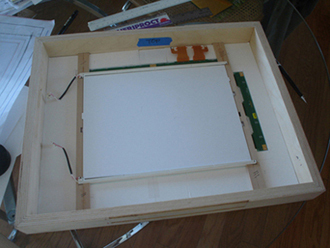 I'm gonna start my DIY-Cintiq project these days, as soon as my parts arrive. As I'll use exactly the same hardware-parts as you did, I just worry a little about the jitter issue at the screentop, wich I'll probably have to face, too. 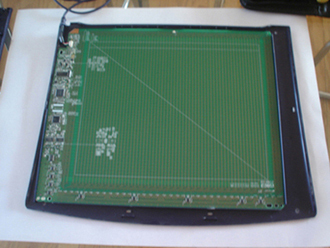 The shielded top PCB you mentioned at the end, did you wrap the whole PCB with copper/aluminium foil or would a single metal sheet between the Wacom and the top PCB do? Have you grounded your shielding? I'm also wondering if the screen doesnt need ventilation?